Want to go to the tip of the Earth? You might explore the Antarctic with its glaciers, the botanic wonderland of the Juan Fernandez Islands, or Easter Island with its famous giant statues, the Moai. ¡Hola! Whether you want to hike the Andes, kick back on the beaches, or even explore thriving cities, Chile is a country that has something for everyone. Chileans say that their country is the "fin del mundo" - so if you've ever wanted to journey to the, "end of the Earth," Chile is the place for you! During your stay, you'll enjoy learning about the amazing history and culture of Chile. The Aymara and Mapuche people have lived in Chile for 12,000 years, and together with the European influences of Spanish, German, and Italian culture, they combine to create a unique blend of old and new within Chile. Celebrate the We Tripantu, or Mapuche New Year, and learn about the indigenous culture of the Andes! Also head for the cities, and experience Santiago A Mil, or "Santiago by the Thousands." The arts and theatre festival is the capital city's largest festival, with three weeks of cultural and artistic activities. 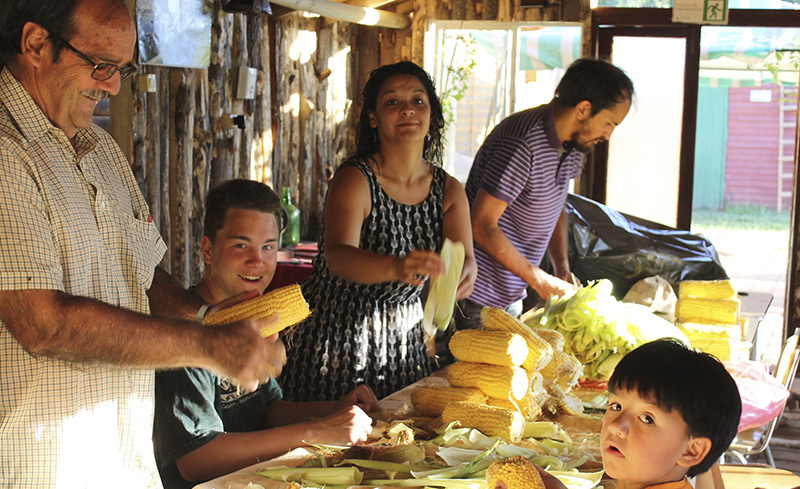 Chileans are exceptionally hospitable people who will welcome you into their homes and hearts for an experience that can only come from living as a Chilean would. Family life is treasured: parents, siblings, and extended family not only live and eat together, but they also enjoy special gatherings and social events as a family. As a member of your host family, you'll experience this unity from the inside out and enjoy developing close ties with your host parents, brothers, and sisters. Influenced by its location and extreme geography, the people of Chile are strong, proud, extremely innovative, and caring. After a challenging day at school, you will probably be itching for some fun. Fortunately, studying abroad in Chile will provide you with many new and exciting things to do with your new friends! Like most Latin American countries, the most popular sport in Chile is fútbol (soccer). Other fun activities include dancing, music, television, and cinema. If you are lucky, during weekends your host family may treat you to a trip to the beautiful countryside or the beach! Your adventure to this wonderful Latin American country will leave you wanting to travel more! After your time in Chile, you may want to live in other South American countries to expand your understanding of South American culture. A diverse continent, South America offers plenty of distinct cultures for you to explore, and there's always something new to learn! Regardless of where you go next, you'll grow to appreciate diverse cultures and gain invaluable experiences during your time in Chile. Learn more about scholarship details and application deadlines. Applications for tuition based programs must be submitted by October 1 for winter/spring departure programs and March 15 for summer and fall. Applications submitted after this date will be considered on a case by case basis depending upon availability. Information regarding visas and other immigration processes will be provided upon enrollment. YFU will pay for registration and tuition fees for enrollment in school, but students must cover the costs of textbooks, uniforms, and activity fees. Program tuition does not include personal spending money. Students are placed in public or private schools and typically in 10th or 11th grade. Courses at any type of school are often compulsory so you may not have a large degree of flexibility when it comes to selecting classes. Students will study Spanish, math, history, science, music, art and physical education. Most Chilean high schools do not offer extracurricular activities. However, YFU students are encouraged to join sports, clubs, or teams in their local communities in order to get involved and meet locals. Outside of regular classes, you can choose to play sports or take computer or art classes. YFU Chile offers a 10-day trip to the north or south of Chile, usually around the Easter holiday. In previous years on this trip, students have traveled by bus to different regions, cities, and villages and have had the opportunity to explore cultural and historic sites, as well as nature. The trip is a great opportunity to make friends with other exchange students and to get to know and appreciate Chilean culture, food, and traditions. The trip will end with a 2-day stay in Santiago, Chile's capital and largest city, where student stay with volunteer host families. This trip is offered to students at an additional cost, which includes transportation during the tour, food, lodging, and entrance fees to any group site visits. Students will learn more about this trip after arrival in Chile. 2019 Spring departure: Dec. 31, 2000 - January 1, 2004; 2019 Fall departure: Aug. 1, 2001 - July 31, 2004. Students who do not meet this age requirement or who will graduate from high school before the start of their program will be considered for admission on a case-by-case basis. Spanish. Previous language study is not required, but self-study is encouraged prior to arrival. Throughout the country. Students are rarely placed in large urban centers.